DTI « What Happened to the Portcullis? The roll-out of special economic zones is under way, with the first two in KwaZulu-Natal and the Free State to be proclaimed shortly, Trade and Industry Minister Rob Davies said on Wednesday. The Dube trade port and the Tshiame industrial development zone in Harrismith would both be transformed into special economic zones as soon as the regulatory framework had been established, which the minister said would take place within the next 100 days. The regulations and guidelines would be finalised. The special economics zones board would be established, as would a one-stop-shop for fast-tracked support to investors. 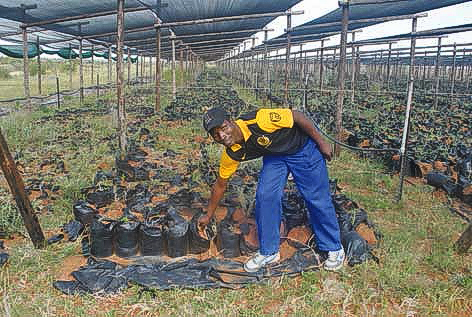 The Dube trade port industrial development zone will specialise in high-value, niche agricultural and horticultural products, as well as manufacturing and value-addition for the automotive, electronics and clothing industries. 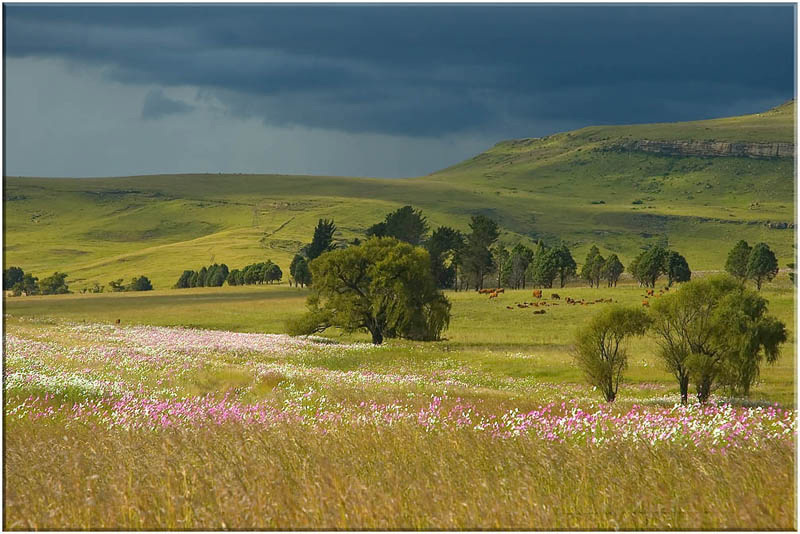 The Tshiame industrial development zone at Maluti-a-Phofung near Harrismith in the Free State will focus on automotive, clothing and agro-processing activities. The Department of Trade and Industry is evaluating the feasibility of special economic zones focusing on the beneficiation and value-addition of platinum in Limpopo and North West. These zones would be used to encourage investors in beneficiation to locate their plants close to the mineral deposits. Opportunities to partner with international producers of fuel cells are available, and have the potential for South Africa to become an established hub for the production of fuel-cell components. The Dti opines that this would be a very significant development because fuel cells are new technology used for back-up power generation in telecommunication masts, base-load power generation in rural areas, and fuel-cell passenger vehicles. The technology is fast becoming the subject of intense international competition for investment and is also a technology well suited to South Africa’s comparative advantage in platinum mineral resources. The department is also assessing the feasibility of a solar industrial development zone in Upington in the Northern Cape. The Saldanha Bay industrial development zone was well positioned to become a hub for oil, gas and marine repair, engineering and logistics. An application to operate as a Customs Control Area to service the West and East African offshore oil and gas industry is being finalised. To date 18 companies, nine local and nine foreign, have signed nonbinding expressions of interest. The review of the revenue sharing arrangement. The five-point plan emerged from realization by SACU Member States of a need to move SACU beyond an arrangement held together only by the common external tariffs and the revenue sharing arrangement to an integration project that promotes real economy development in the region. Minister Davies noted that progress on the implementation of pillars of the five- point plan is uneven. SACU has registered good progress on trade facilitation and there is greater unity of purpose in negotiations with third parties (Economic Partnership Agreement (EPA), SACU-India and Tripartite Free Trade Area). However, there is limited progress on the review of the revenue sharing arrangement and hence lack of adequate financial support for the implementation of cross-border industrial and infrastructure development projects. The SACU revenue pool is raised by South Africa from customs and excise duties. Mr Davies told MPs that in 2013-14 the total disbursement from the revenue pool would be about R70bn of which the BLNS countries would receive about R48bn. There is also lack of progress on the development of SACU institutions as a result of divergences in policy perspectives and priorities of Member States. Enabling provisions provide for the establishment of National Bodies and a SACU Tariff Board. The SACU Tariff Board will make recommendations to Council on tariffs and trade remedies. Davies added that, until these institutions are established, functions are delegated to the International Trade Administration Commission (ITAC) in SA. The minister warned that the lack of agreed policies would hinder effective decision-making on regional integration and industrialisation, which had made little progress since the 2011 summit convened by President Jacob Zuma. South Africa believes SACU needs to move “firmly towards a deeper development and integration”. Among the disagreements on tariff setting between South Africa and its neighbours highlighted by Mr Davies, was that South Africa saw tariffs as a tool of industrial policy while they regarded them as a means of raising revenue. For example, the other Sacu members wanted to include the revenue “lost” on import tariff rebates offered by South Africa into the revenue pool. The pool provides these countries with a major source of their national budget. Rebates were seen as revenue foregone for which additional compensation should be sought. South Africa, on the other hand, argues that the rebates (for example on automotive imports) are part of its total tariff package and serve to attract investment and boost imports and therefore, contribute to expanding the revenue pool, not diminishing it. He emphasised the development of a common approach on trade and industrial policy as the prerequisite for establishing effective SACU institutions in future. He highlighted that a discussion on appropriate decision-making procedures on sensitive trade and industry matters that takes into account SACU-wide impacts is required. Source: The Department of Trade & Industry, and BD Live. Beitbridge to be Zim’s first economic zone? The Chronicle (Zimbabwe) reports that the Ministry of Economic Planning and Investment Promotion and South Africa’s Department of Trade and Industry are creating economic zones in their respective countries to boost investment. Economic zones are areas where local and foreign investors or companies who invest there are given preferential benefits like low tax and low rentals. Speaking during the 4th Investment and Trade Initiative between visiting South African business delegates and Bulawayo business people, the Deputy Minister of Economic Planning and Investment Promotion Dr Samuel Undenge said the Bilateral Investment Promotion and Protection Agreement signed in 2010 by the Zimbabwean and South African Governments would help in the creation of the economic zones. South Africa’s Deputy Director General responsible for Enterprise and Development Mr Sipho Zikode said they were busy crafting a special document to guide the 12 identified economic zones in South Africa. “Messina is one of the chosen economic zones in South Africa and we also want to create linkages with Beitbridge as they are close to each other,” said Mr Zikode. Dr Undenge said there was need for countries to work together to boost economies on the continent. The business seminar was held to achieve mutual economic growth and development through outward investment facilitation, infrastructure development and trade liberalisation between Zimbabwe and South Africa. I post this article given it ties together many of the initiatives which I have described in previous articles. The appears to be an urgency to implement these initiatives, but the real question concerns the sub-continent’s ability to entrench the principles and maintain continuity. At regional fora its too easy for foreign ministers, trade practitioners and the various global and financial lobbies to wax lyrical on these subjects. True there is an enormous amount of interest and ‘money’ waiting to be ploughed into such programs, yet sovereign states battle with dwindling skills levels and expertise. Its going to take a lot more than talk and money to bring this about. South Africa is championing an ambitious integration and development agenda in Southern Africa in an attempt to advance what Trade and Industry Minister Rob Davies describes as trade and customs cooperation within the Southern African Customs Union (SACU), the Southern African Development Community (SADC) and other regional trade organisations. Central to pursuing this intra-regional trade aspiration are a series of mechanisms to combine market integration and liberalisation efforts with physical cross-border infrastructure and spatial-development initiatives. Also envisaged is greater policy coordination to advance regional industrial value chains. “Trade facilitation can be broadly construed as interventions that include the provision of hard and soft infrastructure to facilitate the movement of goods, services and people across borders, with SACU remaining the anchor for wider integration in the region,” Davies explains. This approach is also receiving support from the US Agency for International Development (USAid), which recently hosted the Southern African Trade Facilitation Conference, held in Johannesburg. Trade programme manager Rick Gurley says that virtually every study on trade in sub- Saharan Africa identifies time and cost factors of exporting and importing as the most significant constraints to regional trade potential. Limited progress has been made by SADC member States and SACU partners to tackle the factors undermining trade-based growth, limiting product diversification and increasing the price of consumer goods, including of foodstuffs. However, far more would need to be done to realise the full potential of intra-regional trade. One high-profile effort currently under way is the Tripartite Free Trade Area (T-FTA), which seeks to facilitate greater trade and investment harmonisation across the three existing regional economic communities of the SADC, the Common Market of Eastern and Southern Africa and the East African Community. The existing SADC FTA should be fully implemented by the end of the year, with almost all tariff lines traded duty-free and, if established, the T-FTA will intergrate the markets of 26 countries with a combined population of nearly 600-million people and a collective gross domestic product (GDP) of $1-trillion. At that size and scale, the market would be more attractive to investors and could launch the continent on a development trajectory, Davies avers. It could also form the basis for a later Africa-wide FTA and a market of some $2.6-trillion. However, as things stand today, intra- regional trade remains constrained not merely by trade restrictions but by a lack of cross-border infrastructure, as well as poor coordination and information sharing among border management agencies such as immigration, customs, police and agriculture.Cross-national connectivity between the customs management systems is also rare, often requiring the identical re-entry of customs declarations data at both sides of the border, causing costly and frustrating delays. USAid’s regional economic growth project, the Southern African Trade Hub, is a strong proponent of the introduction of several modern trade-facilitation tools throughout the SADC – a number of which have already been successfully pioneered. These tools, endorsed by the World Customs Organisation (WCO) Framework of Standards, which offers international best-practice guidelines, are aimed at tackling the high costs of exporting and importing goods to, from, and within Southern Africa, which has become a feature of regional trade and discouraged international investment. A country’s competitiveness and the effec- tiveness of its trade facilitation regime are measured by its ranking on World Bank indices and, with the exception of Mozambique, Southern African States perform poorly – with most in the region settling into the lowest global quartile of between 136 and 164, out of a total of 183. “Our transaction costs in Africa across its borders are unacceptably high and inhibit trade by our partners in the private sector,” says WCO capacity building director Erich Kieck. “We need our States to develop good ideas and policies, but the true test lies in their ability to implement them,” he notes. He adds that not only does trade facilitation require efficient customs-to-customs connectivity, but also demands effective customs-to-business engagement, adding that, while customs units are responsible for international trade administration, they are not responsible for international trade. “The private sector is the driver of economic activity and international trade, and government’s responsibility is to understand the challenges faced by the business community and develop symbiotic solutions,” Kieck notes. Despite the establishment of regional trade agreements and regional economic communities in Southern Africa, many partner- ships have failed to deliver on their full potential to increase domestic competitiveness. In a report, African Development Bank (AfDB) senior planning economist Habiba Ben Barka observes that, despite the continent’s positive GDP growth record – averaging 5.4% a year between 2005 and 2010 – it has failed to improve its trading position or integration into world markets. In 2009, Africa’s contribution to global trade stood at just under 3%, compared with nearly 6% for Latin America and a significant 28% for Asia. “Since 2000, a new pattern of trade for the continent has begun to take centre stage, as Africa has witnessed an upsurge in its trade with the emerging Brazil, Russia, India and China economies. Overall, Africa is trading more today than in the past, but that trade is more with the outside world than internally,” says Ben Barka. She adds that while many African regional economic communities have made some progress in the area of trade facilitation, much greater effort is required to harmonise and integrate sub-regional markets. To address enduring trade barriers, consensus among business, government and trade regulators appears to lean towards the adoption of one or a combination of five facilitation tools. These include the National Single Window (NSW), the One-Stop Border Post (OSBP), cloud-based Customs Connectivity, Coordinated Border Management (CBM) and Customs Modernisation Tools. NSWs connect trade-related stakeholders within a country through a single electronic-data information-exchange platform, related to cross-border trade, where parties involved in trade and transport lodge standardised trade-related information or documents to be submitted once at a single entry point to fulfil all import, export and transit-related regulatory requirements.Mauritius was the first SADC country to implement the NSW and consequently improved its ranking on the ‘Trading Across Borders Index’ to 21 – the highest in Africa. It was closely followed by Ghana and Mozambique, which have also reported strong improvements. Developed in Singapore, the benefits of government adoption include the reduction of delays, the accelerated clearance and release of goods, predictable application, improved application of resources and improved transparency, with several countries reporting marked improvement in trade facilitation indicators following the NSW implementation. In South Africa, the work on trade facili-tation is led by the South African Revenue Service (SARS), which focuses on building information technology (IT) connectivity among the SACU member States, and strengthen- ing risk-management and enforcement measures. However, SARS’ approach to the NSW concept remains cautious, Davies explains. “SARS has considered the viability of this option as a possible technological support for measures to facilitate regional trade, but considers that this would fall outside the scope of its current approach and priorities in the region,” he said. As reported by Engineering News in December last year, effective OSBPs integrate the data, processes and workflows of all relevant border agencies of one country with those of another, which culminates in a standardised operating model that is predictable, trans- parent and convenient. An OSBD success story in Southern Africa is the Chirundu border post, where a collaboration between the Zambia and Zimbabwe governments has culminated in a single structure, allowing officers from both States to operate at the same location, while conducting exit and entry procedures for both countries. Launched in 2009, this OSBP model is a hybrid of total separation, joint border operations and shared facilities in a common control zone. Implementation of the model has reduced clearance times to less than 24 hours, significantly reduced fraudulent and illegal cross-border activity, enabled increased information sharing between border agencies and reduced the overall cost of export and import activities in the area. Earlier this year, former South African Transport Minister Sibusisu Ndebele indicated that Cabinet was looking into establishing a mechanism that would bring all border entities under a single command and control structure to address the fragmentation in the country’s border operations, particularly at the high-traffic Beitbridge post between South Africa and Zimbabwe. “The ultimate vision is to create one-stop border operations to facilitate legitimate trade and travel across the borders,” he said. Improved connectivity between customs limbs in sub-Saharan Africa has perhaps made the most indelible strides in the region, with improved IT connectivity between States identified as a priority by Sacu. 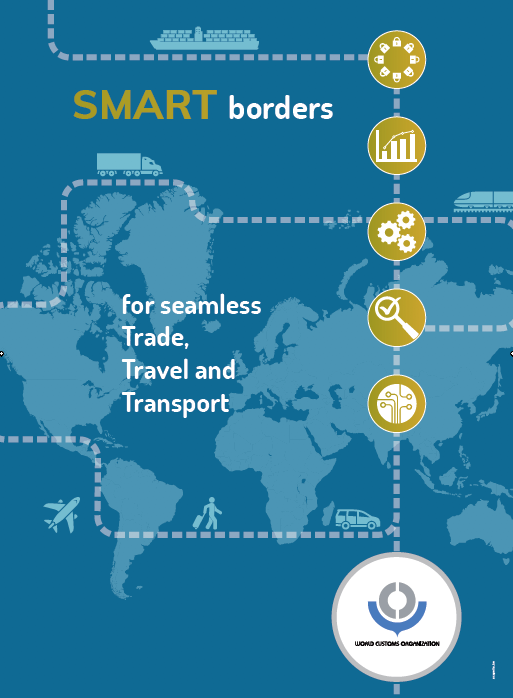 This includes customs-to-customs inter- connectivity, customs-to-business inter- connectivity and interconnectivity between customs and other government agencies. SACU members have agreed to pursue the automation and interconnectivity of their customs IT systems to enable the timely electronic exchange of data between administrations in respect of cross-border movement of goods. “As a consequence of this acquiescence, we have identified two existing bilateral connectivity programmes as pilot projects to assess SACU’s preferred connectivity approach, cloud computing between Botswana and Namibia and IT connectivity between South Africa and Swaziland,” says SACU deputy director for trade facilitation Yusuf Daya. He adds that a regional workshop was recently convened to explore business processes, functions, data clusters and the application of infrastructure at national level to improve and develop intra-regional links. The SADC has been a strong proponent of CBM efforts in the region, which promotes coordination and cooperation among relevant authorities and agencies involved in, specifically, the protection of interests of the State at borders. “The union has drafted CBM guidelines for its members on implementation, based on international best practice, and has received indications of interest from several member States,” explains SADC Customs Unit senior programme officer Willie Shumba.He adds that CBM is a key objective of regional integration, enabling the transition from an FTA to a customs union and, eventually, to a common market, through effective controls of the internal borders. South Africa’s customs modernisation initiative is well advanced and came about following Sars’ accession to the WCO’s revised Kyoto Convention in 2004, which required customs agencies to make significant changes to it business and processing models. These changes included the introduction of simplified procedures, which would have fundamental effects on and benefits for trade and would require a modern IT solution. Since its inception, the SARS Customs Modernisation Programme has gained tremendous momentum, with amendments to the Passenger Processing System and the replacement of SARS’s Manifest Acquittal System in the Automated Cargo Management system. Further adjustments were made to enable greater ease of movement of goods, faster turnaround times and cost savings, as well as increased efficiency for SARS. This phase included the introduction of an electronic case-management system, electronic submission of supporting documents, the centralisation of back-end processing in four hubs and an electronic release system and measures to enhance the flow of trucks through borders – in particular at the Lebombo and Beitbridge borders. AfDB’s Ben Barka warns that, prior to the implementation of any border improvement efforts by countries in Southern Africa, a thorough analysis and mapping of each agency’s existing procedures, mandate and operations should be undertaken.“Based on these findings, a new set of joint operational procedures need to be agreed upon by all involved agencies and must comply with the highest international standards,” she says. Development coordination between States is essential, as the largest disparity among regional groupings, in terms of intra-regional trade, is clearly attributable to their differentiated levels of progress in various areas, including the removal of tariffs and non-tariff barriers, the freedom of movement of persons across borders and the development of efficient infrastructure. Source: Engineering News. ZIMBABWE’S export trade promotion body, ZimTrade, has warned against over-reliance on South African imports, stressing that Harare could plunge into a serious economic crisis should its southern neighbour experience unexpected production and supply challenges. South African producers of basic commodities, automobile services, chemicals, agricultural inputs and farm produce have taken advantage of a significant weakness in Zimbabwean firms’ capacity to service the domestic market, which has triggered widespread shortages of locally manufactured goods. South Africa and Zimbabwe have intensified trade relations, but the balance of trade has always been in favour of South Africa, Africa’s largest economy. In March, South Africa’s Deputy Minister of the Trade and Industry, Elizabeth Thabethe, flew into Zimbabwe with a delegation of 45 businesspeople to intensify the hunt for new markets for her country’s companies north of the Limpopo. The business delegation comprised companies in the infrastructure (rail, telecommunication and energy), manufacturing, agriculture and agro-processing, mining and mining capital equipment, as well as information and communication technology. If South Africa, for example, is to experience a supply hitch, this will be transmitted directly into Zimbabwe’s production and consumption patterns. The appreciation of the rand in the second quarter of 2011, for instance, resulted in price increases on the domestic market.In other words, heavy dependency on imports will leave an economy susceptible to world economic shocks, according to ZimTrade. Statistics provided by the Department of Trade and Industry (dti) of South Africa in March, indicated that exports to Zimbabwe increased to R15,5 billion in 2011, from R15,1 billion in 2010, while Zimbabwe’s exports to that country increased to R2,9 billion in 2011, from R1,3 billion in 2010. The statistics indicate that South Africa imported US$1 billion worth of goods and services from the Southern African Development Community trade bloc, with 37 percent of the imports coming from Zimbabwe. The dti said imports from South Africa represented 45 percent of Zimbabwe’s total imports. Therefore, according to ZimTrade, “A growing trade deficit could increase the country’s risk of imported inflation and a direct transmission of shocks into the economy.